As a food blog browser, it's easy to notice foodie trends...because everyone is writing about them! Take quinoa for instance. I'd never heard of it before. It's only been in the past few months that I've noticed quinoa recipes popping up all over the world of food blogs. Of course, since I'd never cooked or eaten quinoa, I immediately put in on my list of "things to try." First, there is the issue of pronunciation. I had been saying it like "kwin-OH-ah." Come to find out, it's pronounced like "KEEN-wah." Gluten-free, and easy to digest, quinoa has all the goods that grains and seeds are supposed to have (dietary fiber and so on). The real kicker though? Quinoa has the highest protein levels (up to 20%) of all the cereals -- pseudo or otherwise. 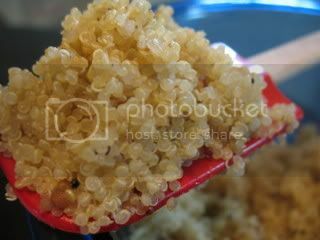 Quinoa is tiny; it reminds me of sesame seeds. This is only a 1/2 cup measuring cup full. *Note: Most recipes call for rinsing & draining the quinoa, but I found it to be pretty difficult to do without a very fine mesh strainer. Even then, the quinoa seeds are so tiny...I ended up just making a mess trying to get the wet seeds from the strainer into a pan. So, I started over and didn't rinse. It turned out fine. I would just pick over the quinoa to make sure there isn't anything unappetizer lurking about. In a medium saucepan, combine all the ingredients. Bring to a boil, then cover and reduce to a simmer. Simmer for about 12 minutes, or the water has been absorbed and the quinoa has puffed, become translucent, and opened (you'll see the curly-q inside). Remove the pot from the heat and let rest, covered, for about 5 minutes. Fluff the quinoa with a fork before serving. At this point, I mixed the cooked quinoa with eggplant cubes that I had sauteed in olive oil & garlic, tiny orange tomatoes, sliced Kalamata olives, feta cheese, & a lemon vinaigrette. You could mix in a variety of veggies or dressings, but I also thought the grain tasted pretty darn good on its own. It has a slightly nutty taste and a satisfying little crunchy texture. It's more flavorful than couscous and rice. I am anxious to try quinoa for breakfast, prepared like oatmeal with fruit and nuts on top. For more sweet & savory quinoa recipes, see Heidi Swanson's 101 Cookbooks. I love quinoa. I went blabbing on and on about to anyone who would listen after I made it the first time, pronouncing it the wrong way, of course. Fortunately, I don't think anyone noticed. I'm really terrible at keeping my pantry stocked, but I always have a bag of this stuff sitting around. I really like preparing it according to Bittman's recipe for "Quinoa Pilaf" in his How to Cook Everything book- with an onion and sauteeing the grains before adding the liquid. Extra toasty flavor! My health counselor recently perfected her recipe for quinoa muffins ... I had one for breakfast the other day and it kept me satisfied and fueled for hours. It's one of the best sources of protein I've ever found! I wonder how many carbs this contains...I'd be interested to know if you still have the packaging. I often make quinoa salads to have with fish on hot days- it is so good in a citrus dressing with just a few roasted veggies thrown in.
? If you look up close they look a lot like something else- but I won't say what for now! I just saw it! Heehee. After they're cooked, quinoa grains definitely look like TINY CONDOMS!! 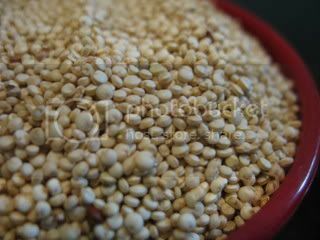 The recipes usually call for rinsing the quinoa before cooking because it is coated in saponins, which can be mildly toxic. I give lectures to Bariatric support groups as part of my job, I just discovered Quinoa a week ago, and have been trying to create some recipies to go into highly specialized diets, Quinoa really lends itself well right into most diets out there. So far my favorite is a Red Curry and Saffron Quinoa Pilaf with Sweet Corn and Black Beans. Now... just to be sure to give fair warning on such a combination of protiens and fiber, eat in extreme moderation or dont plan on leaving the house for awhile. This is a fantastic food and I really look forward to my next demonstrations!